Mary Stark and David Chatton Barker, artists based in Manchester, UK, are visiting Toronto. Please join us for a night of film performance and sonic spells at the one and only CineCycle, the especially specially fantastic cinema venue in Toronto. We'll show individual and collaborative films and performance works made over the last two years, as well as fresh from the processing buckets of this year’s Independent Imaging Retreat, otherwise known as Phil Hoffman’s Film Farm. Mary’s artist filmmaking practice is specifically informed by previous training in textile practice. 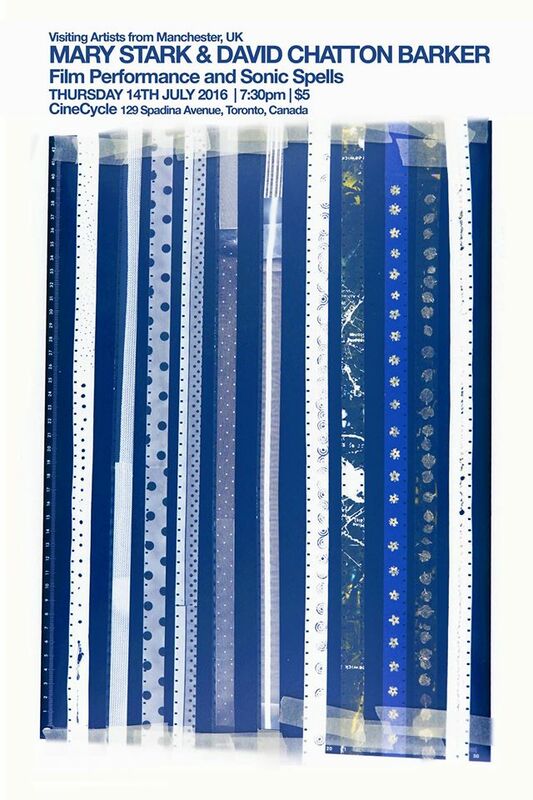 Since 2012 Mary has been exploring the filmstrip as fabric through 16mm film performances with optical sound. Mary works physically with a deconstructed skeletal frame of cinema, handling reels of film sculpturally, involving unspooled film projectors to explore the cinematic apparatus in relation to the human body, light and shadow. In 2014 she undertook an artist residency at LIFT, the Liaison of Independent Filmmakers of Toronto. Recent shows include Contact Festival of New Experimental Film and Video and a commissioned cameraless 35mm film in response to the Delia Derbyshire Archive. David works with alchemical processes transmuting the mundane into the mystical, combining mechnical and natural forms through analogue film, homemade instruments and performance. Since 2011 David Chatton Barker has led the nationally acclaimed project Folklore Tapes encompassing experimental music, film and performance. He has curated events and performed at the Arnolfini Gallery, Café Oto and Spacex Gallery, as well as organizing a sell-out national tour and programming a storytelling tent at Port Eliot Festival. Early this year he undertook an international residency on the island of Oro, Finland, investigating the changing landscape through filmmaking and performance.